The food at Luxe is as clean as its décor: simple Mod Oz fare with plenty of meat-free options on the menu, and lots of low-alcohol and virgin options at the bar. Returning Singaporean Chui Lee Luk is the creative director in charge of the finer-than-café fare here, bringing the 3 Hat accolade awarded to her in 2005 – the first female to be conferred in over a decade – for Sydney fine dining spot Claudes. Swish items like raw prawn bottarga dressed with champagne vinegar fall short ($24) – they come in tiny portions, taste flat and feature lacklustre plating. One month after their soft launch, Chui adds freshly shucked Galway oysters ($36/six), and familiarity to the menu with her own XO sauce, served with grilled octopus ($21). The basic eats are better. The wild weed pie ($24) is a satisfying take on Greek spanakopita pie, showcasing a blend of brightly flavoured greens rather than the usual spinach. The Luxe Burger ($25) is a solid sandwich, with green chilli padi butter complementing slices of hanger steak. Also check out the breakfast and lunch menus: you’ll find pies, sandwiches, eggs and hearty salads. 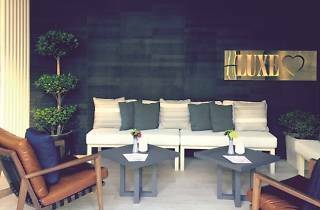 That’s where Luxe excels. 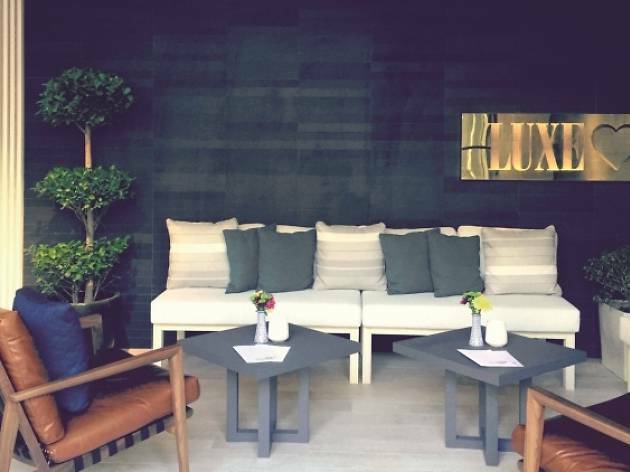 Luxe is mostly patronised by Aussie expats who already know about the chain from back home. But we think it’ll soon draw the daytime crowd – the bar-filled street is just aching for a good brunch spot. Edit: A few dishes mentioned in the print edition of this review have been removed from the menu. We have since updated the review. Tue-Fri noon-midnight, Sat 9am-midnight, Sun 9am-4pm. The Sunday brunch tradition continues! This time, my aunt and I headed to a different part of the city, near Chinatown. The area is in fact a popular destination for foodies, whether it’s for a local food fix, brunch cafés or bars. This place has them all! After some quick research the morning of, we decided to go for Luxe. This has been on my radar for a while but I never seem to have enough time to visit all the cafés I want when I’m back. I’m glad I had the chance to this year though because it was a delight! I opted for the Luxe Plate, which consisted of two slices of sourdough toast, half an avocado, feta cheese, rocket, roasted tomatoes, and I added the additional poached eggs. Even though this was a vegetarian option, it was rather filling because the slices of toast were generous! The poached eggs were done well – a firm exterior and a lovely, runny yolk when cut into. The avocado was also well sliced and proportioned – it was just enough to go along with the dish and to act as a spread on the toast. I liked the inclusion of feta cheese because of how creamy it was! This too acted as a great spread on the toast. The roasted tomatoes were well seasoned with herbs, which gave it a rather Mediterranean flavour. Also included on the plate was a dish of butter, which I didn’t have because I don’t like butter when it’s at room temperature and spreadable. I prefer mine straight out of the fridge and still slightly solid – weird, I know! To accompany my brunch, I went for a Soy Cappuccino. Those who have been following my blog for a while might know that I’m actually soy intolerant but I decided to give it a try since it’d been quite some time since I last had any – secretly hoping nothing would happen, and it didn’t! Weirdly enough, I didn’t seem to bloat in the hours following this meal but I’m still cautious of how much I consume – this cup wasn’t very large so I believe the actual amount of soy milk wasn’t excessive. I was impressed with the quick service, given it was prime weekend brunch time and how few staff there were when we first came in. Equally impressive was that taste and combination of the dishes we ordered. Even though they were not the most visually appealing, they were yummy! I liked how simple my order was – it was a typical combination of ingredients, prepared well, and spot on with taste. In terms of the atmosphere, I liked how laidback this café was. You can walk straight in before being seated by a member of staff, the layout is spacious so you don’t feel crammed against other tables and customers, and it was very bright with natural light. The décor seemed quite modern with wooden surfaces and metallic pieces. Definitely a café worth coming back to! One of the worst dining experiences I have had in Singapore. Wife and I ordered meals and both had issues. Ordered a chicken burger and got a Beef Buger. Wife ordered the Aussie Breakfast and it arrived without some of the advertised sides. Waiter didn't bother to even tell us. When we asked the waiter about it, he was rude and arrogant. He actually suggested for me just to have the beef burger! Never going back!